The Pearly King and Queen – Bert and Rebecca (Becky) Matthews were Pearly King and Queen of Hampstead. Bert was born in 1884 and died in 1970. Becky was born in 1884 and died in 1963. 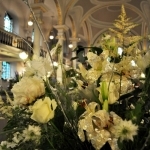 They met at Hampstead Parochial School and were married at Hampstead Parish Church in 1905. Bert was rat catcher for the then Hampstead Borough Council. One day, he was called in to clear a house in Heath Street. When he had finished, the butler refused to pay him so the furious Bert opened the sackful of live rats which he had just caught and let them loose in the hallway. Bert and Becky Matthews also lived in Flask Walk and in New End. As the Pearly King and Queen of Hampstead they raised a lot of money for charities and in recognition of their good works, they were invited to the Coronation of Queen Elizabeth II at Westminster Abbey. Bert was the subject of ‘This is your Life’ in 1964. The “Pearly” tradition started in the East End of London in the mid 19th century. 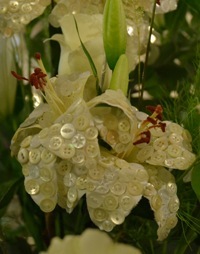 Its members distinguished themselves by decorating their clothing with pearl buttons. This page was last updated on July 18th, 2012.